Series producer Nobuyuki Okajima reveals what's different (and what's not) in the EDF series' newest insect-obliterating rampage. Nobuyuki Okajima	EDF series Producer, D3 Publisher Inc.
Hello gamers! 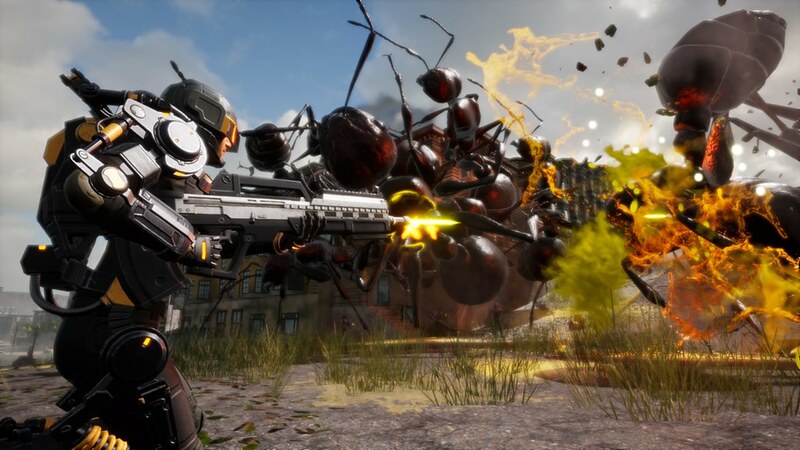 At last, Earth Defense Force: Iron Rain will be released for PlayStation 4 on April 11, 2019. 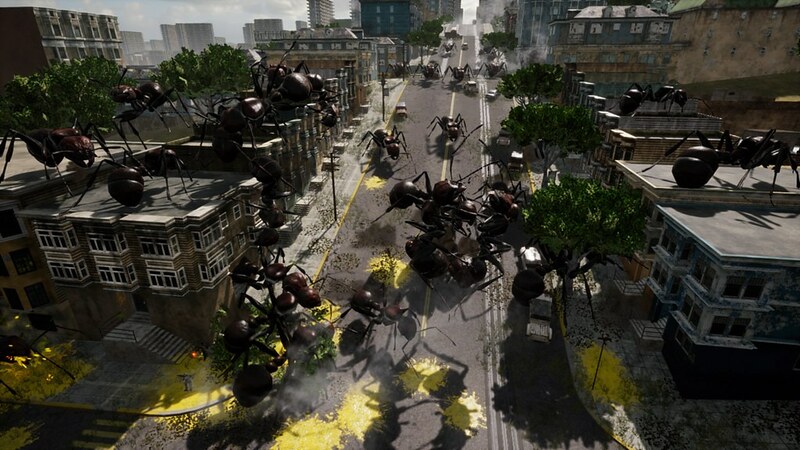 Earth Defense Force: Iron Rain is a brand new EDF game, which utilizes the same game concept as that of the original EDF numbered series, but with different game design. EDF is a panic-action-shooter born from the Japanese developer, Sandlot. The game provides a unique experience which is created by using the opposite two components of “overwhelming sense of hopelessness” and “overwhelming sense of fresh experiences,” being co-existent in gameplay. This is a universal experience that continues to be offered throughout the series and has been drawn on the concept of “a human being confronting huge and massive enemies”. As the gigantic aliens fill the screen to a large extent, players of the game instantly become an EDF soldier and can use hundreds of weapons and arms to fight against them. People were addicted to the virtual experience of fighting, using courage and wisdom before the hopeless sight of all these large enemies. Everyone would definitely run away if this happened in real life! People started to talk and share their unique game experiences and this sense of fresh gameplay and accomplishment when winning battles have captivated many gamers from that point forward, through today. The series is 15 years old since its concept, the number of EDF soldiers continues to increase, and EDF 4.1 has produced more than 500K enlistments throughout the world. 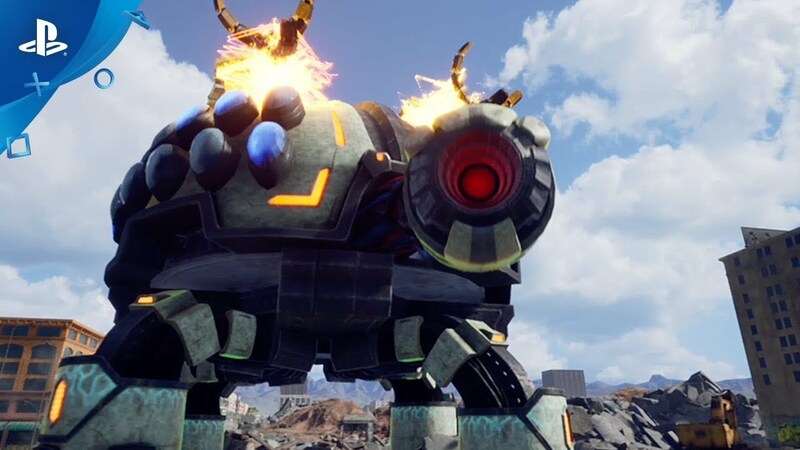 Also, the latest mothership title EDF 5 was launched in US and EU territories this past December 2018. The game sold more than 370K units throughout Japan and became the highest selling EDF title of all. That being said, we think EDF 5 will definitely break the sales record on a worldwide basis. The numbered EDF series boasts overwhelming popularity in Japan and many core gamers are playing the series around the world. 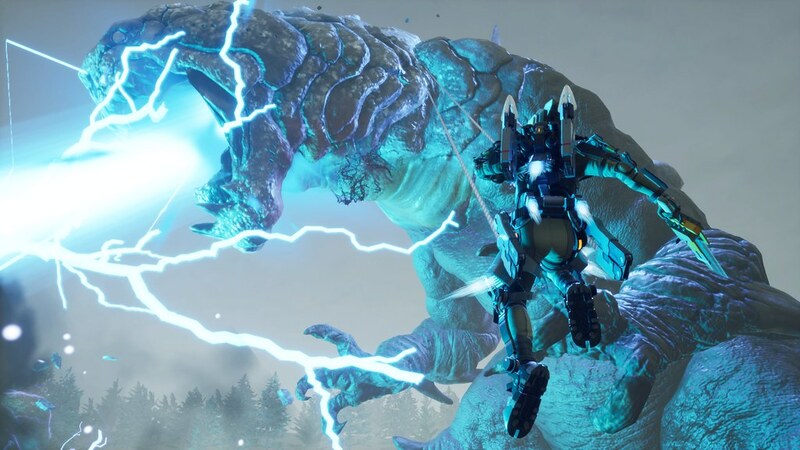 I strongly believe that once gamers experience this unique taste of EDF battling, everyone will understand how unique and exciting the game can be. On the other hand, I also realized that there are things to be done in order to bring more Western gamers into EDF to appreciate what the game stands for. First of all, we had to change the locations and world settings of the game. If the battles only take place in the streets of Japan, I feel that US and EU gamers would all be bored at some point. One of the reasons the game boasts high popularity in Japan is the important essence of “the monsters that strike us in our cities should be destroyed indiscriminately!” So in order for Western gamers to understand this essence, we had to change the areas and locations to places that will be more familiar to those players. We also had to consider changing the graphics. Even though I love the graphical taste of the EDF series overall, we knew we needed to let gamers try out this wonderful game at least once with its original graphics. Recognizing graphics shouldn’t be an obstacle though, we realized we had to bring the graphics closer to what most Western gamers prefer. It was a necessary task for the EDF franchise to break through in the Western market in order to maximize and contain elements the Western gamers would be more pleased with. However, since I feel strongly that the EDF series is well respected as is, I didn’t want to make too many big changes to the EDF series for US and EU markets. After all, gamers who have been playing the original EDF series for a long time may not like some of the changes we will be making. 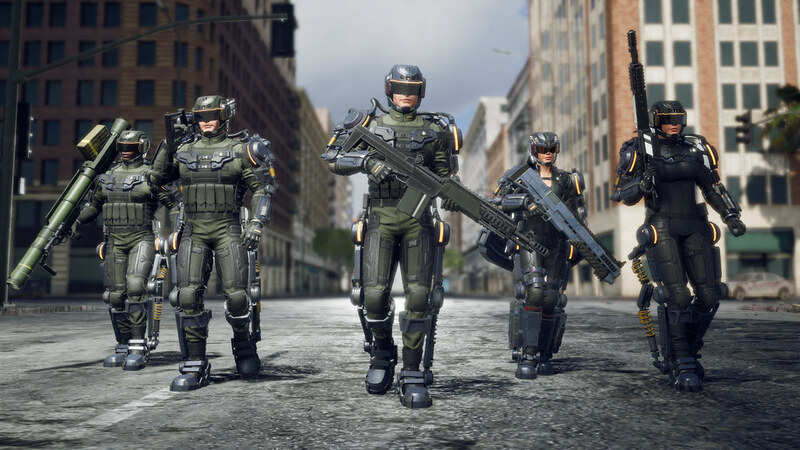 Even though EDF is a game that already exists as a format, and core-fans will likely evaluate the brand rigorously, the creators at Yuke’s worked very hard on the new project. I would like to make sure that all EDF fans know the fact that the Yuke’s creators were very enthusiastic and came up with numerous new ideas, showed respect to EDF as a brand and Sandlot as a developer, and were very proud to develop a brand new EDF game themselves. So it’s like an EDF with better graphics or how do i understand this? My question too! Looks nice though. It’s a garbage spinoff by a garbage dev. Play EDF5. PVP? I’m interested to learn more. Will it be EDF vs EDF or will one side get to control the monsters/bugs/aliens? Really looking forward to this. I still have plenty of EDF5 to finish before April. Please release this and EDF5 as a PHYSICAL disc!! I’ve not purchased EDF5 yet due to the fact it’s only a digital release. Not everyone wants to store a large game file virtually and be stuck discless. It’s like 14 gigs. It’s tiny. Discs require a full install anyway, genius. They use the same amount of install space as a digital copy. If you’re going to spend 100s of hours completing something like EDF5, you’re better off going digital. I am also always for Physical copies. I got the Chinese physical copy of EDF5, which happens to be completely in english which is awesome. But that could easily not be the case with this one. When you buy those Asian discs, you need an Asian account to get the damn DLC, and the DLC on 5 is the best of the series. I decided to wait to buy EDF 5 ever since Iron Rain was announced. As much as I love all the EDF games, I need a break and I think this is exactly what I need to keep me engaged with the series. Can’t wait to play! Iron Rain will be nothing compared to 5. Yukes is a terrible dev. Sandlot’s games are the only proper EDF games. Amazing. You jabber on with all that text and fail to provide important info like whether or not there will be a disc and when the hell the pre-order will actually appear on the US PSN store!? Also, tell the idiots at D3 to give us the mission packs for EDF5 too so we can get those done before this releases. I’ll keep an eye on this one. I’d prefer physical, as I always do. Playing through 5 for the third time this week moving on to the Fencer class (after finishing it once as Ranger and Wing Diver), still loving it. Now that the fist expansion came out today for 5, excited to take on the new challenge. This looks similar but also has a slightly different flavor with the artstyle being a bit more modern and the enemy designs being more organic. I’m willing to try this new iteration and give it a shot. Please don’t disappoint us.